High in fiber, low in fat... this combination of quinoa, spinach, and sweet potato is wonderful and nutritious, keeping you healthy and satisfied! In a large sauce pan, add the vegetable broth, sweet potatoes, and quinoa. Bring to a full boil. 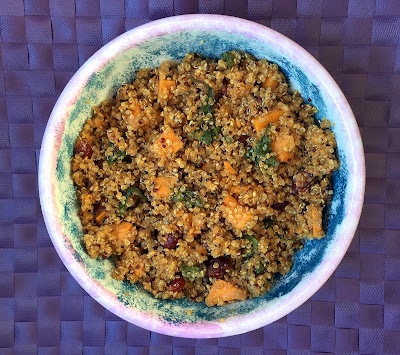 Reduce heat to low, cover, and let simmer for 15 to 20 minutes, until the sweet potatoes and quinoa are tender and the water has been absorbed. Add the spinach and cranberries, combine thoroughly, and enjoy! If you'd like a printer-friendly version of this recipe, Click Here.